I live (and work!) 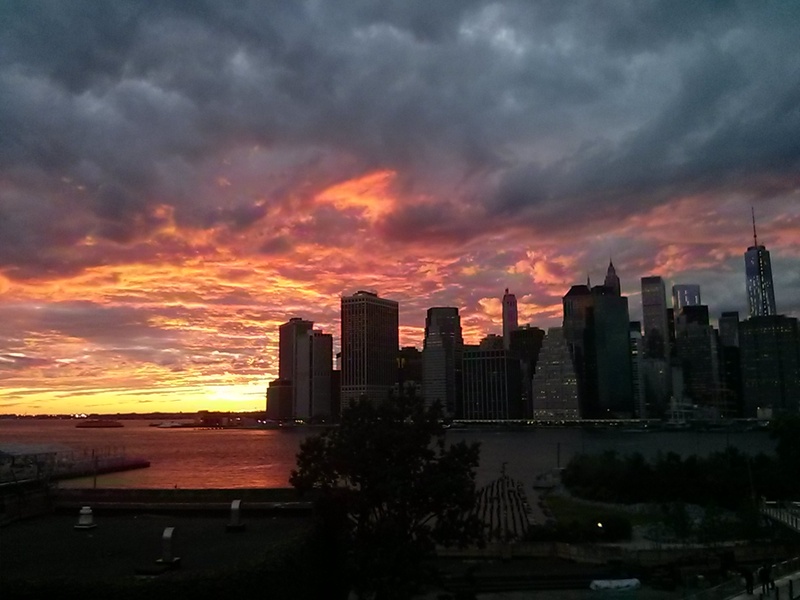 near one of the most beautiful vantage points for sunsets in possibly the entire US. However almost every beautiful sunset I have seen from there has come from either 1) me walking out of work and noticing that the sky is bright pink, or 2) seeing someone post a sunset photo on Twitter (I know). 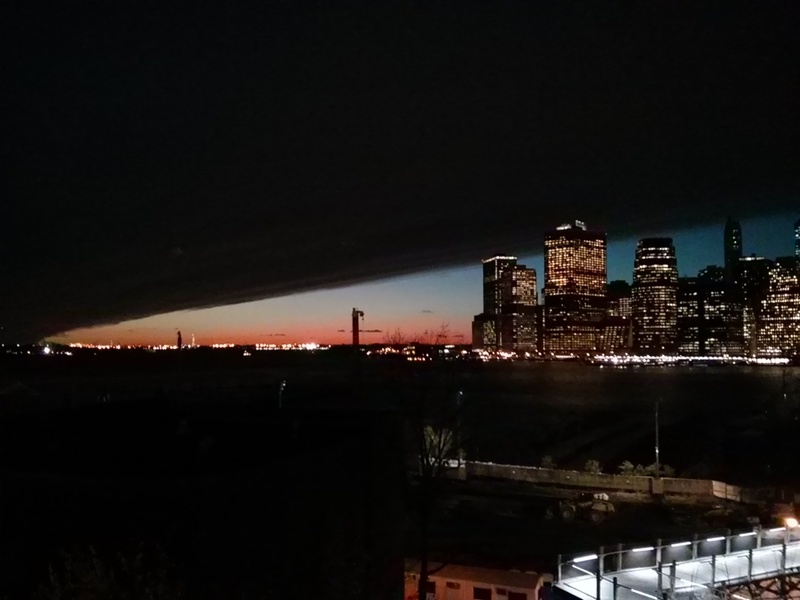 Either way it ends with me practically sprinting to the Brooklyn Heights Promenade for the tail end of the sunset. So, I decided to create some Google Calendar “appointments” for myself, using R and specifically the sunrise.set() function (thanks Carlos!). Because I’m a big user of Google Now, this means that–based on my location and travel time–my phone will buzz at me and tell me to leave for the Promenade in time to see the sunset. You can upload the .CSV directly into your Google calendar (just be careful as it will import a different event for every day, so if you do it mistakenly it will be a pain to remove!). I’ll give instructions for creating a new calendar just for the sunsets, so you can remove it whenever you want if your calendar looks too cluttered. Create a new calendar, called “Sunset”. If you want to share the calendar, make it Public. Under the “Other calendars” heading, click on “Import calendar”. 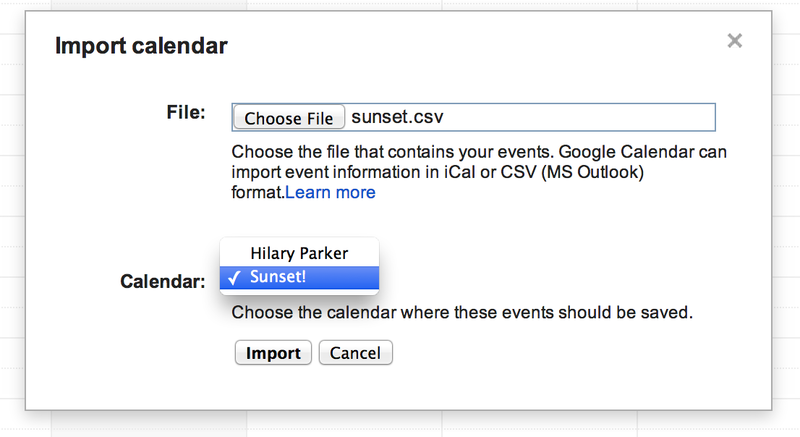 Select the .CSV you created using the create_sunset_cal() function, making sure you select your newly-created “Sunset” calendar. Henceforth be notified about the travel time to the sunset! I’ve always had a special fondness for my name, which — according to Ryan Gosling in “Lars and the Real Girl” — is a scientific fact for most people (Ryan Gosling constitutes scientific proof in my book). Plus, the root word for Hilary is the Latin word “hilarius” meaning cheerful and merry, which is the same root word for “hilarious” and “exhilarating.” It’s a great name. Several years ago I came across this blog post, which provides a cursory analysis for why “Hillary” is the most poisoned name of all time. The author is careful not to comment on the details of why “Hillary” may have been poisoned right around 1992, but I’ll go ahead and make the bold causal conclusion that it’s because that was the year that Bill Clinton was elected, and thus the year Hillary Clinton entered the public sphere and was generally reviled for not wanting to bake cookies or something like that. Note that this all happened when I was 7 years old, so I spent the formative years of 7-15 being called “Hillary Clinton” whenever I introduced myself. Luckily, I was a feisty feminist from a young age and rejoiced in the comparison (and life is not about being popular). In the original post the author bemoans the lack of research assistants to perform his data extraction for a more complete analysis. Fortunately, in this era we have replaced human jobs with computers, and the data can be easily extracted using programming. This weekend I took the opportunity to learn how to scrape the social security data myself and do a more complete analysis of all of the names on record. 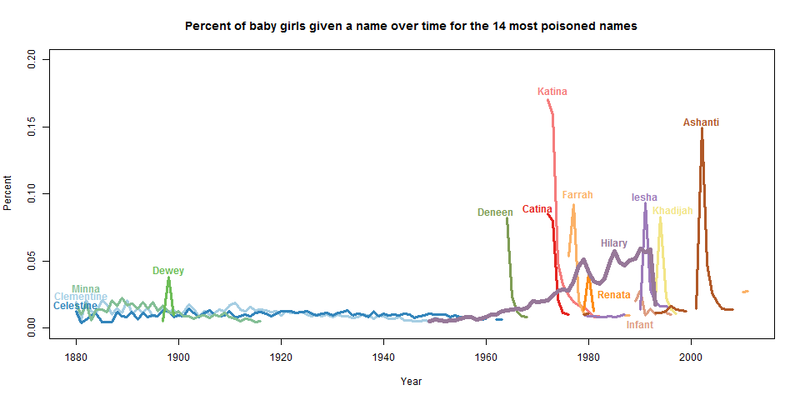 Is Hilary/Hillary really the most rapidly poisoned name in recorded American history? An analysis. I will follow up this post with more details on how to perform web-scraping with R (for this I am infinitely indebted to my friend Mark — check out his storyboard project and be amazed!). For now, suffice it to say that I was able to collect from the social security website the data for every year between 1880 and 2011 for the 1000 most popular baby names. For each of the 1000 names in a given year, I collected the raw number of babies given that name, as well as the percentage of babies given that name, and the rank of that name. For girls, this resulted in 4110 total names. In the original analysis, the author looked at the changed rank of “Hillary.” The ranks are interesting, but we have more finely-tuned data than that available from the SSA. 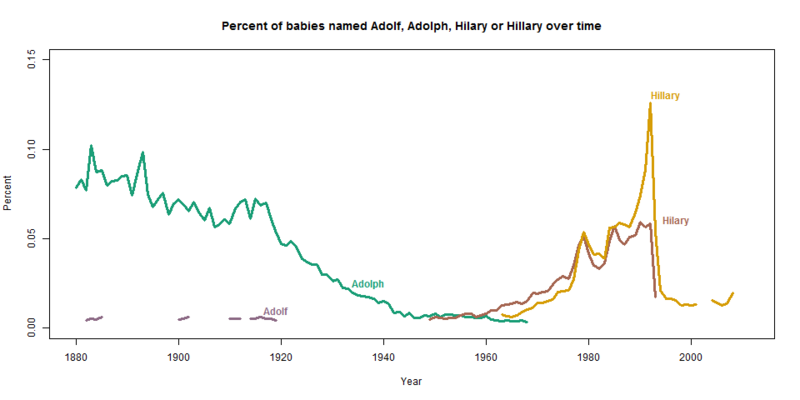 The raw numbers of babies named a certain name are likewise interesting, but do not normalize for the population. Thus the percentages of babies named a certain name is the best measurement. Looking at the absolute chance in percentages is interesting, but would not tell the full story. A change of, say 15% to 14% would be quite different and less drastic than a change from 2% to 1%, but the absolute change in percentage would measure those two things equally. Thus, I need a measure of the relative change in the percentages — that is, the percent change in percentages (confusing, I know). Fortunately the public health field has dealt with this problem for a long time, and has a measurement called the relative risk, where “risk” refers to the proportion of babies given a certain name. For example, let’s say the percentage of babies named “Jane” is 1% of the population in 1990, and 1.2% of the population in 1991. The relative risk of being named “Jane” in 1991 versus 1990 is 1.2 (that is, it’s (1.2/1)=1.2 times as probable, or (1.2-1)*100=20% more likely). In this case, however, I’m interested in instances where the percentage of children with a certain name decreases. The way to make the most sensible statistics in this case is to calculate the relative risk again, but in this case think of it as a decrease. That is, if “Jane” was at 1.5% in 1990 and 1.3% in 1991, then the relative risk of being named “Jane” in 1991 compared to 1990 is (1.3/1.5)=0.87. That is, it is (1-0.87)*100=13% less likely that a baby will be named “Jane” in 1991 compared to 1990. So, for each of the 4110 names that I collected, I calculated the relative risk going from one year to the next, all the way from 1880 to 2011. I then pulled out the names with the biggest percent drops from one year to the next. 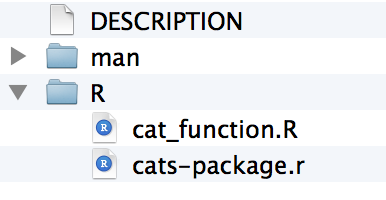 These plots looked quite curious to me. While the names had very steep drop-offs, they also had very steep drop-ins as well. “Khadijah” was a character played by Queen Latifa in Living Single, and “Ashanti” was popular because of Ashanti, of course. “Hilary”, though, was clearly different than these flash-in-the-pan names. The name was growing in popularity (albeit not monotonically) for years. So to remove all of the fad names from the list, I chose only the names that were in the top 1000 for over 20 years, and updated the graph (note that I changed the range on the y-axis). I think it’s pretty safe to say that, among the names that were once stable and then had a sudden drop, “Hilary” is clearly the most poisoned. 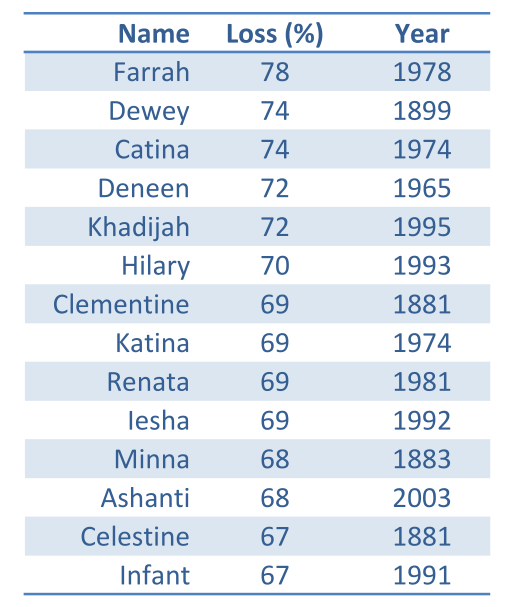 I am not paying too much attention to the names that had sharp drops in the late 1800s because the population was so much smaller then, and thus it was easier to drop percentage points without a large drop in raw numbers. 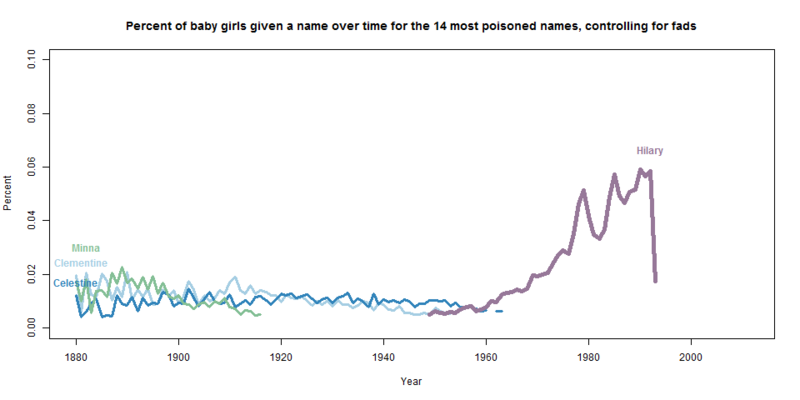 I also did a parallel analysis for boys, and aside from fluctuations in the late 1890s/early 1900s, the only name that comes close to this rate of poisoning is Nakia, which became popular because of a short-lived TV show in the 1970s. At this point you’re probably wondering where “Hillary” is. As it turns out, “Hillary” took two years to descend from the top, thus diluting out the relative risk for any one year (it’s highest single-year drop was 61% in 1994). 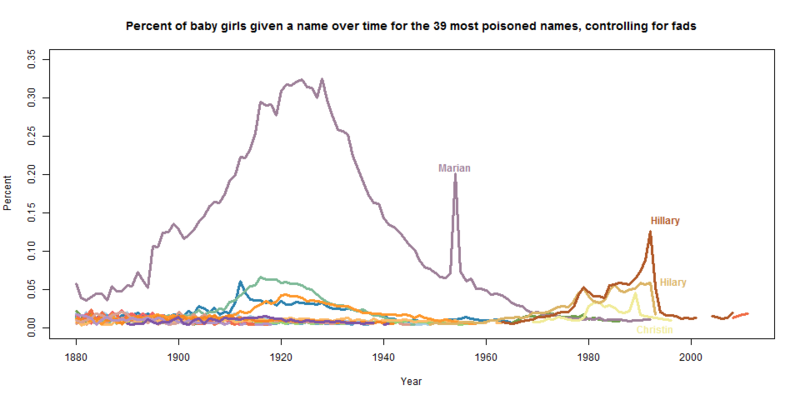 If I examine slightly more names (now the top 39 most poisoned) and again filter for fad names, both “Hilary” and “Hillary” are on the plot, and clearly the most poisoned. So, I can confidently say that, defining “poisoning” as the relative loss of popularity in a single year and controlling for fad names, “Hilary” is absolutely the most poisoned woman’s name in recorded history in the US. Code for this project is available on GitHub. Update: This seems to be an analysis everyone is interested in. For perhaps the first time in internet history, Godwin’s Law is wholly appropriate. 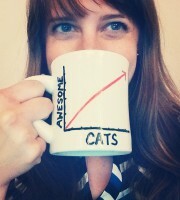 Sometimes this is my life. But it’s so satisfying when you write a program that saves you time! Here is an example. For several years at Hopkins I have been involved in teaching a large (500+ person) introductory Biostatistics class. This class usually has a team of 12-15 teaching assistants, who together staff the twice-daily office hours. TAs are generally assigned to “random” office-hours, with the intention that students in the class get a variety of view-points if, for example, they can only come to Tuesday afternoon office hours. When I started the course, the random office-hours were assigned by our very dedicated administrative coordinator, who sent them out via email on a spreadsheet. Naturally, there were several individual TA conflicts, which would result in more emails, which would lead to version control problems and — ultimately — angry students at empty office hours. Additionally, assigning TAs to random time-slots for an 8-week class was a nightmare for the administrative assistant. I really wanted us to start using Google Calendar, so that students could easily load the calendars into their own personal calendars, and that changes on the master calendar would automatically be pushed to students’ calendars. So, in order to achieve this goal, I wrote a function in R that would automatically generate a random calendar for the TAs, write these calendars to CSV documents that I could then upload to a master Google Calendar. It has worked wonderfully! My general philosophy with this project was that it is much easier to create a draft and then modify it, than it is to create something from scratch that fits every single parameter. So, I controlled for as many factors as I reasonably could (holidays, weekends, days when we need double the TAs, etc.). 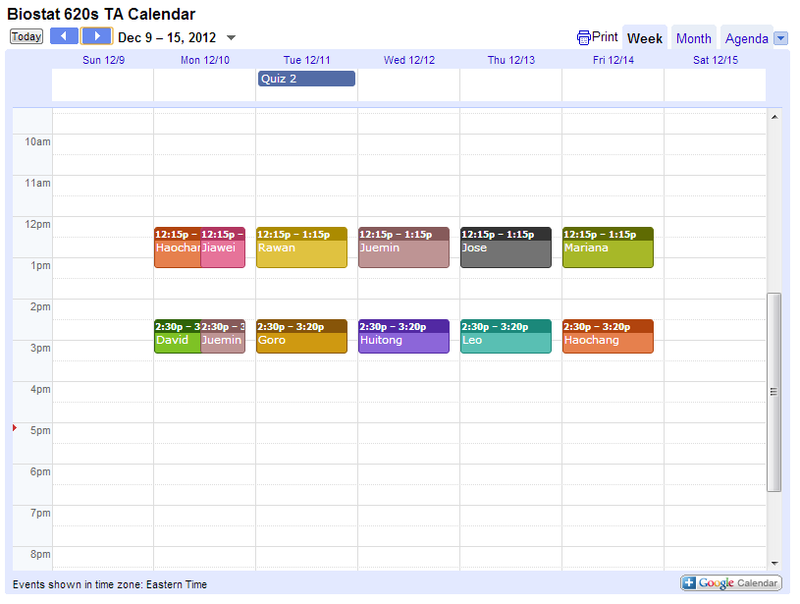 Then, as TAs have conflicts or other problems arise, I can just go back and modify the calendar to fit individual needs. You’d be amazed — even with each TA having several constraints on his or her time, I generally only need to make a few modifications to the calendar before the final draft. 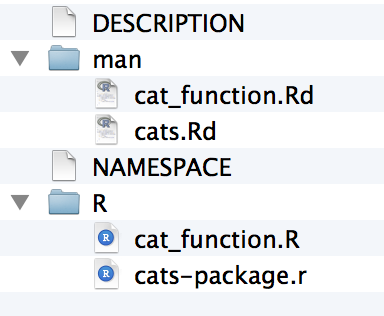 Randomness works! 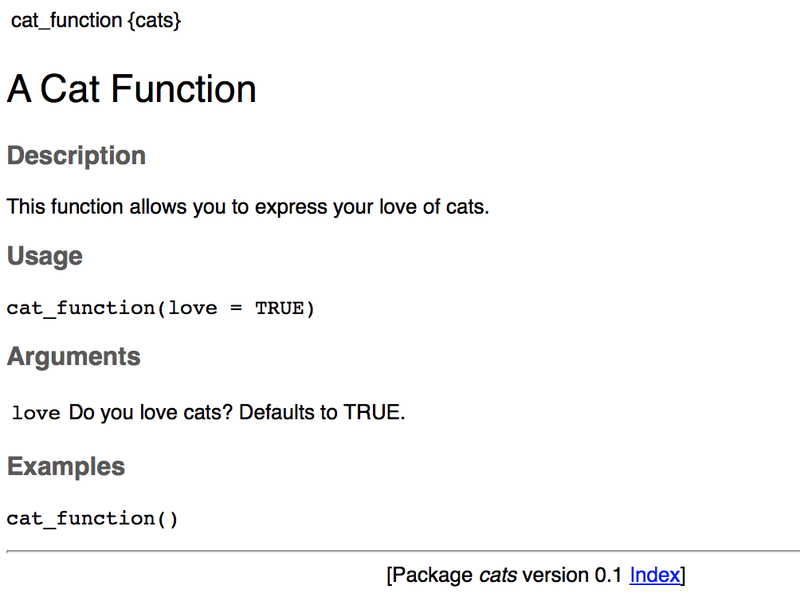 There are a few tricks that made this function work seamlessly. My code below depends on the chron package. To assign TAs, it’s best to think about the dates for your class as a sequence of slots that need to be filled, omitting weekend days, holidays and other days off, and accommodating for days when you might need twice as many TAs (for example right before exams when office hours are flooded). Now that you have the sequence of dates, you need to randomly fill them. I accomplish this by dividing the sequence of dates into bins that are equal to the number of TAs, and then randomly sampling the TA names without replacement for each of the bins. This might leave a remainder of un-filled days at the end, so you have to make up for that as well. This way, even though the TAs are randomly assigned, I avoid assigning one person to time-slots only during the last week of classes, for example. The final step is writing these schedules out into a CSV format that can be uploaded to Google Calendar (here’s the format needed). I create a separate CSV for each of the TAs, so that each has his or her own calendar that can be imported into a personal calendar. mat$"All Day Event" <- "False"
mat$Description <- "Biostat 621 TA Schedule"
This saves a HUGE amount of hassle! Here’s the workflow for creating the calendars. Of course, this is very specific to the class I helped teach, but the general workflow might be helpful if you’re facing a similar scheduling nightmare! Using this function (github — use the example template which calls the gen_cal.R function), create a random calendar for each of the TAs. These calendars will be saved as CSV documents which can then be uploaded to Google Calendar. There are options for the starting day of class, ending day of class, days off from class, days when you want twice as many TAs (for example, right before an exam), and some extra info like the location of the office hours. Bonus step: Once all the calendars are imported, embed the calendars onto a website (keep secret from students in the class if you don’t want them to know when certain TAs are working!). This serves two purposes. First, it serves as the master calendar for all of the TAs and instructors. Second, by distributing it to TAs, they can add their calendar to their personal Google Calendar by clicking the plus icon on the bottom right corner. Your final beautiful product will look something like this! (Note that I also created a calendar that has important class dates like the quizzes and exams). Time spent developing and implementing: ~3 hours. Time spent each semester re-creating for new TAs: ~30 minutes. Time saved by myself, the administrative coordinator, and all of the TAs — and instead spent feeling awesome: infinity.